We took off our shoes at least 565 times. We climbed 6,899 steps. We admired 22,576 Buddhas. I made up the numbers, but they may not be far off. 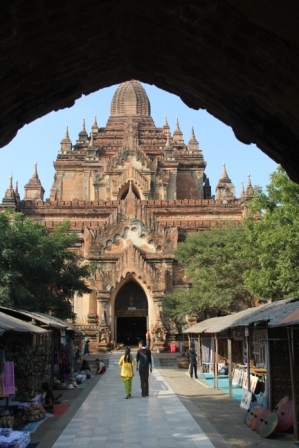 A trip to Myanmar, a fascinating land in the throes of long overdue changes, is much about about temples (you cannot enter wearing shoes), all adorned with countless statues of Buddha. And, many of those temples are accessed only by long climbs up steep steps. 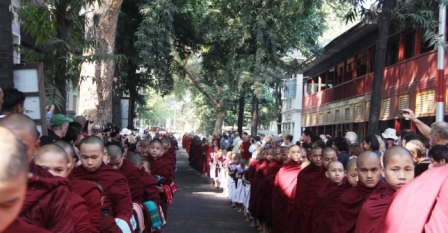 “This is Burma. It is quite unlike any place you know about,” wrote poet and novelist Rudyard Kipling after a visit to the county more than a century ago. Today the country is known as Myanmar, but his words still echo true. 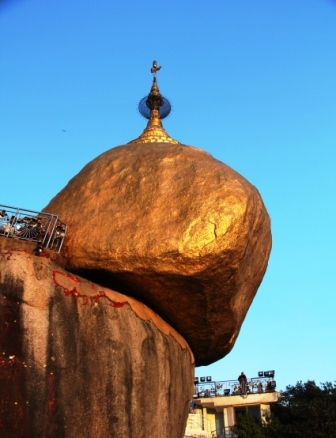 During our travels we were overwhelmed with mind boggling sights: a cave with 8,700 Buddha statues, a giant golden rock miraculously clinging to the edge of a chasm . . .
. . . parades of monks draped in burgundy colored robes lined up to receive food offerings, women whose faces appeared to be smeared with mud…. We visited big, chaotic cities (Yangon and Mandalay). 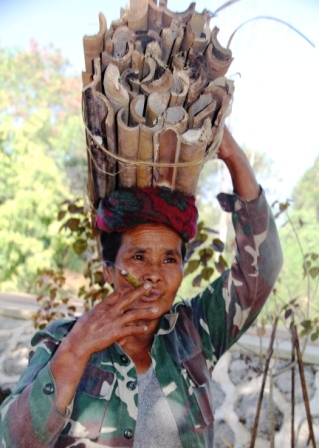 Women smear their faces with a paste made from logs. It acts as a sun block and moisturizer. 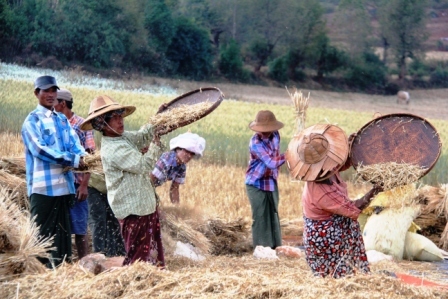 During drives through the countryside we witnessed the simple, primitive way of life of farmers, and often suffered bouncing over rutted roads. 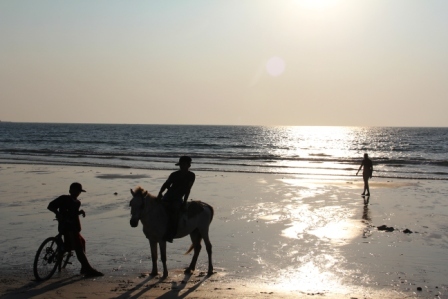 We chilled out at a perfect beach resort, not yet spoiled by hordes of tourists. I loved the colorful markets, the tasty food, and learning about the people and their staunch devotion to Buddha. More about all will follow in several blogs. First, a word about the shaky start of this incredible voyage. Facebook Friends have seen posts on what follows, but many Tales and Travel readers are not on FB. Crisis Number One: Before landing in Frankfurt where we boarded the plane for the long flight to Singapore, I asked BB (husband Bicycle Bob and long suffering travel companion) if he had the credit card. We had agreed that only one of us needed to take a card. “No, you have it,” he said. “No, you are supposed to have it,” I answered. Major misunderstanding. Bottom line: No credit card and not an auspicious beginning to a five-week long trip. Panic. Stress. Anger. We only had a brief layover in Frankfurt, but we had plenty of time between planes in Singapore before flying on to Yangon. We made numerous calls back to our friends and house sitters, Dee and Allan, in France. They researched methods of getting a credit card to us. French Chronopost came to the rescue. 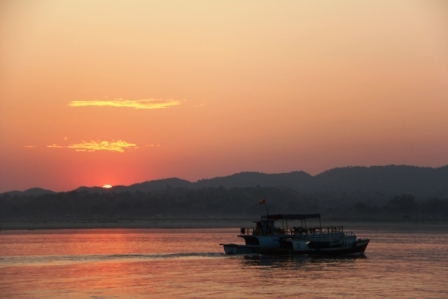 Other services, such as DHL, would not deliver to Myanmar. That was on Friday. Monday afternoon in Yangon we had the card. A miracle! Cost for this amazing service, just 58 euros. We were fine at the onset of the trip without the card. Cash, new US dollars (issued after 2006) and not folded, is currently the recommended currency for travelers in Myanmar. Some places do take credit cards, but charge a hefty fee. We had an ample supply of dollars ordered from our bank, so even without the plastic, we could enjoy meals without washing dishes. But, we would need the card before the end of the trip. We were saved by Dee and Allan and Chronopost. Crisis Number Two: My tooth. The day the credit card arrived, I woke up with a toothache. Surely it will go away, I thought. No such luck. It only got worse, and worse, and my cheek began to look as if I had a tennis ball in my mouth. 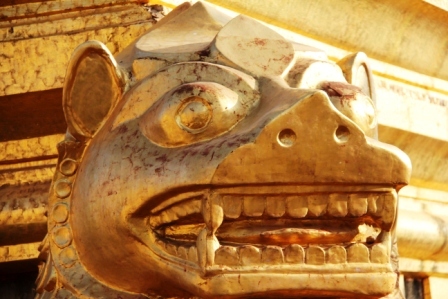 Our guide took me to a dentist recommended by our first rate tour company, Asian Trails. He spoke some English, and his office appeared clean. He wore gloves, a mask, and had many pretty and very young assistants. He said it was a wisdom tooth, gave me pain pills and antibiotics, and cautioned me to avoid the “odors of hot oils” ?? If it did not get better, I could come back and he would extract the tooth. The medication helped for one day only. However, I had fears of letting this dentist pull my tooth, especially when the guide told me the dentist had told him it would be better to wait and have the tooth extracted when I got back to France as complications could arise. He obviously did not want the job. Our return to France was five weeks down the road. I could not live with this pain for five weeks. As mentioned, I had posted our troubles on Facebook. One friend wrote that the trip was “doomed.” World travelers Dee and Allan advised not to have a tooth extracted in Myanmar where hygiene and sanitary conditions are dicey. A young woman I met, a 21-year-old pediatric dental assistant in Connecticut traveling with a group of Jehovah Witnesses for a conference, said I definitely needed to get rid of the tooth. It is probably infected, she said, and the infection would only spread… and could even lead to death. Sacre Bleu! If a Jehovah Witness advises a medical procedure, you know action is required. BB waits in dentist office number 2. 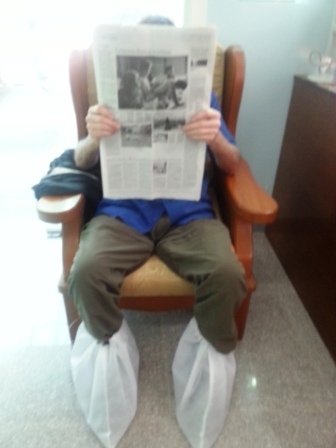 Shoes must come off, but instead they covered his. Fear of stinky feet? American Embassy. They recommended Dr. Aung Myint who saved the trip, and, who knows, maybe my life. I was relieved just entering his classy office with certificates from Denmark and Paris posted on the walls of the waiting room where copies of Fortune, Newsweek and Reader’s Digest were offered as reading material. His equipment was state of the art –far more up to date than many dentist offices I have seen in southern France. We had been to our dentist before departing as a security check. No problems. Why did this tooth suddenly go bad? Could be stress, the super dentist replied. Aha — blame it all on the forgotten credit card. He pulled the tooth and all was well. X-ray, tooth extraction and stitches: $70. We found many more bargains during our travels, but that was the winner. 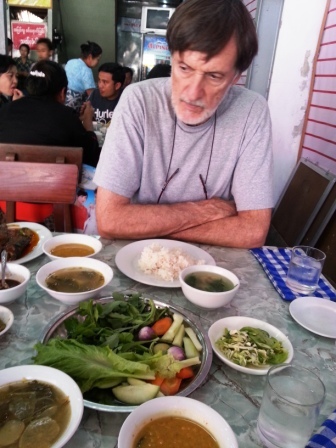 As mentioned, food in Myanmar is good and different. We had many versions of a delicious avocado salad. See recipe column on right for the versison made at the cooking school we attended while at the beach. The Cordon Bleu it was not — our “cooking school” kitchen. Don’t be put off by appearances. Food was delicious. 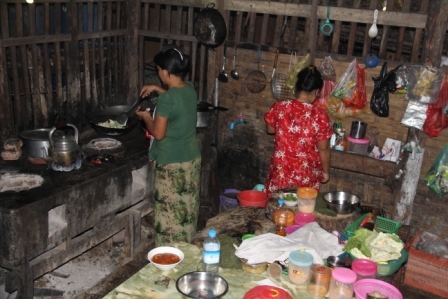 Following, a photo gallery of Myanmar as a preview of coming blog posts. Comments are appreciated. So are new subscribers. 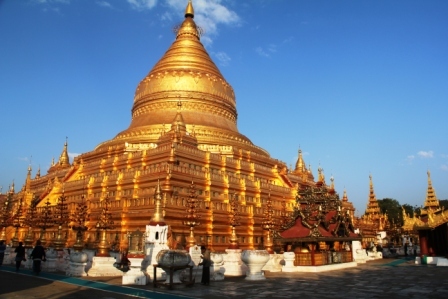 Don’t miss coming Myanmar blogs. Click on Email Subscription, top right or the “Follow” button at the bottom of the screen. 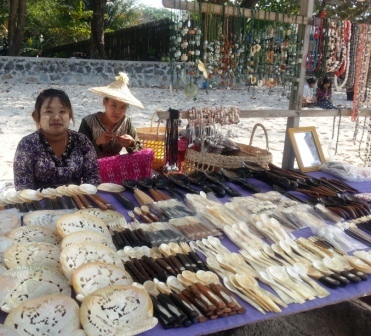 Souvenir sellers on the beach where mother of pearl items are popular. 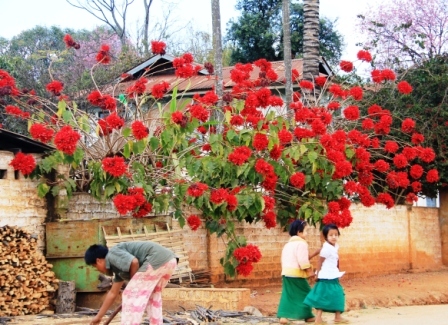 Poinsettia blooming along the road. 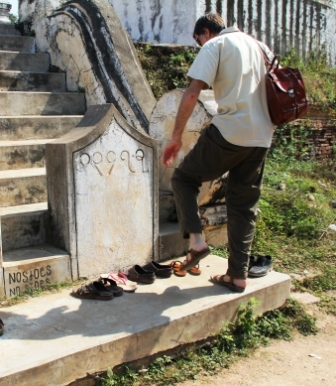 Shoes — and socks– must come off before entering temples. 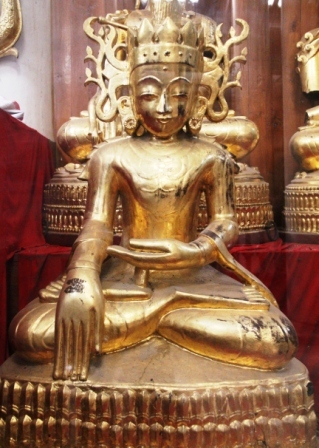 Buddha statues are often golden. 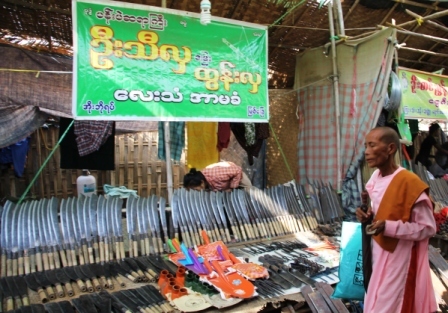 Nuns, seen here at market knife stand, wear pink. Temple in Bagan, the Angkor Wat of Myanmar. 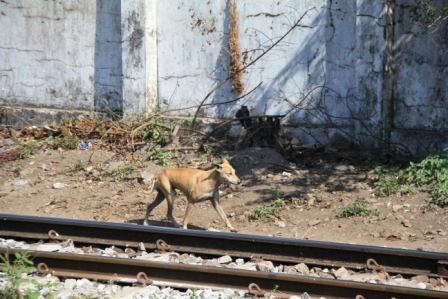 Too many homeless dogs in Myanmar. Most all look like this fellow. Cleaning the “ordinary class” train car at Yangon station. 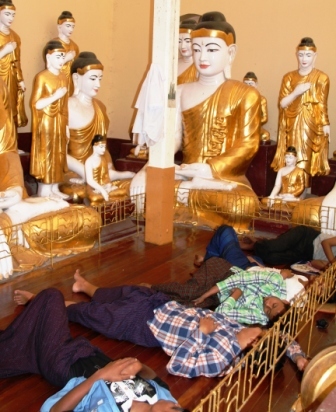 Temple workers take a siesta break under the watchful eyes of Buddhas. 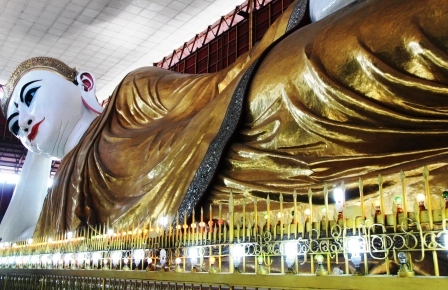 Reclining Buddha. 235 feet long. Thanks for sharing your thoughts on beach resort destinations in asia countries. Thanks for every other informative web site. Where else could I get that type of info written in such an ideal approach? Thanks for the comment, Gayle. Hope to see you soon. Sorry about the late comment…think we may have been traveling when this came out…anyway, I’m sort of hyperventilating right now, just reading about what you went through with your tooth–photos are gorgeous, by the way–transported me back to a tooth crisis I had years ago in Germany…thank goodness the primo dentist materialized!!! So very happy (whew!) that you were able to complete your very exotic and much anticipated trip and got back safe and sound. Not a good way to begin a trip to a foreign land. Seems as if you definitely found a place that is unlike any place that you have visited. Travel off the beaten path. 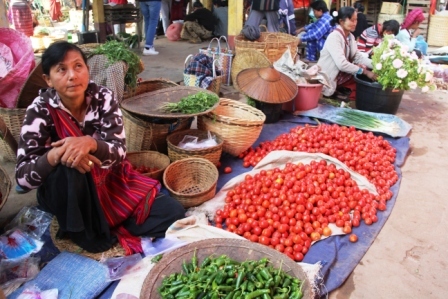 Myanmar is exotic and unique, a marvel to explore. Fortunately after the initial debacles, all was well. Hi Pat, Glad to hear you are enjoying Thailand. 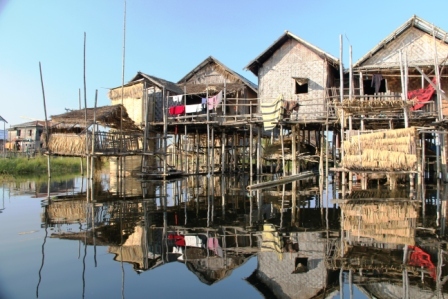 Do add Myanamr to your bucket list, as well as Cambodia, Vietnam and Laos. I’ve loved them all. Thanks Lynne — my most faithful blog follower. Your comments make my day. And, yes there will be more Myanmar to come. Thank you, Len. With your outstanding journalistic credentials, I especially value your comments. To tell the tooth, Leah, this was really a prize-winning blog, unfolded dollars, Chronopost and all. Well done . . . nice pics, too. What gorgeous photos! I will read this with Carl later today. 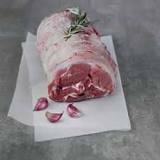 Hi Anne, hope you liked reading. I should have known, editor extraordinaire that you are, you’d go to the source for the truth. But, what’s a few less steps anyway?